I expect that many people have one favourite book that lies around for days, or weeks, months or even years. A book that is picked up and put down again at regular intervals. My favourite at the moment gets stuffed into my bag, that is always huge so that it can hold a camera, a notebook and the favourite book of the day to be read on the tram or at the doctor's, in the local cafe on a Saturday night, even when walking down the road! It is the book that appears over a space of time in every room in the house. On the kitchen table for a week to be read at breakfast, beside the bath to be perused during those long soaks, on the balcony during the summer and on the sofa beside the heater in the winter. 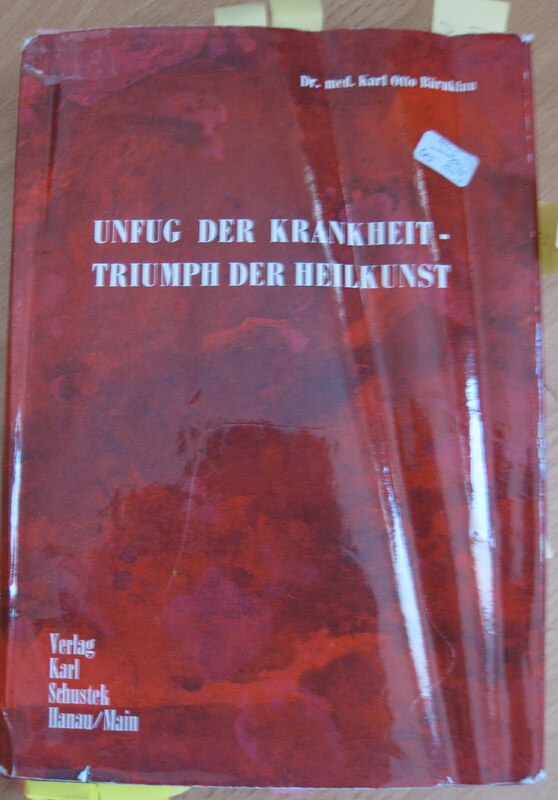 The book that gets stuffed in to my bag all the time at the moment is: Unfug die Krankheiten, Triumph die Seele by Dr. Med. Karl Otto Barnklau, alias AP (András Pető). My copy is so dilapidated now, since it has flown to England on several occasions, to Norway and Hungary too. It has joined me on several long train journeys, accompanied me on many local tram and bus trips, and has even been read in the bath. All this has contributed to its now having a pretty shabby appearance. It is full of sticky “Post-its”, as part of my endeavour to give it some kind of index. I want to write a list of the many people mentioned in the book' and then find an Internet link to them and the therapy or treatment that they are connected to, if possible. This is a long slow process that will probably only get finished after I retire! I have had my copy of the Unfug for about three years and it is beginning to look a bit like my well-loved childhood Teddy, which, just like my Unfug, was also second-hand when I got it. That makes Teddy about eighty years old but the Unfug only forty-five. Directly after I purchased both my Bärnklau books, I tried in vain to get a second copy of the Unfug. The first book, Gibt unheilbare Krankheiten? Nein can be found ten a penny at several Internet-based bookstores, I found one once for as little as two Euros seventy-five cents. This book has always been available whenever I have made a search. I have purchased a couple as presents for friends that, like my own copy, arrive in pristine condition complete with dust jacket. A secret stash in the attic? I rather suspect that somewhere there is a stash of unsold “Gibt unheilbare Krankheiten, Nein” books somewhere in Germany or Austria, just like there are boxes of unsold Dinas at the Library in Birmingham. It is not the same story with the Unfug, unless there is indeed a stash somewhere but no one has yet discovered it. I have been searching for my second copy for years and it was only two week ago that I at last tracked down not one, but two copies' at the same place, both of which I purchased immediately. One in reserve to replace my well loved, much read copy should it ever give up the ghost completely, a copy to look nice on the bookshelf while the other continues to travel around with me. The second newly purchased copy will be a present for another AP fan! I wonder whether I have discovered the reason why Unfug has been more difficult to find than the other, smaller book. Do people actually read it, and therefore it remains on their bookshelf and does not get sold? I also found links to articles that I and others have written where we refer to him and his books in relation to our conductive work. Most interesting was that the blog that I had found had not only referred to Bärnklau but had actually picked out a chapter in the book that I am really interested in, where my book mark is placed at this very moment. The spot in my book where the pages are most thumbed and covered in Post-its. Most of this chapter was there to be read in the blog that I unearthed. The author of the book on Konduktive Förderung refers to Bärnklau knowing that he was András Petö; the author of the blog probably did not have any idea of who he is, and perhaps had no idea until he subsequently learnt from me that conductive education and upbringing exist. “In the following I allow myself to present an article from Dr. Med. Karl Otto Bärnklau. He can give some clarity to our uncertainty about the nature of the human being. Because some of the things he mentions could be somewhat “ grotesque” for the reader even though since their publication much has changed, I have inserted, in bold lettering, some extra information that should immediately make the ideas published nowhere near as distant or grotesque. The articles from Dr. Karl Otto Bärnklau are worth reading for everyone of us, but those who feel themselves to be ailing or plagued with fear should certainly read them. Quite amazing really to discover that there is someone recommending Bärnklau as a valuable read, someone who finds it so important as to print a whole chapter of his book, the chapter on Buddhism, beginning on page 311! Presumably it is still is. Unfortunately when I just tried to get back into this interesting blog to have another read I found that it is now open onlyfor invited readers. A shame really as just last week I found that there is much to be read about the healthy soul there, which could have something to do with the author’s discovery of the Unfug in the first place. Is this central Europe’s way of preventing illness? 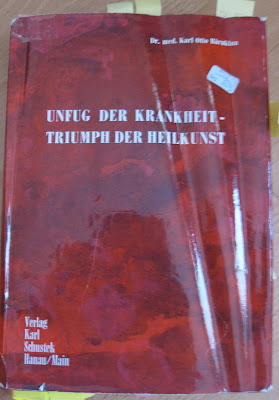 During my search for copies of the Unfug and while looking in the Internet for anything about any of the people mentioned in this book, I came across many other books in the German language, most of them written between 1920 and 1960, with very similar contents to the Bärnklau books. They were all collections of extracts from articles and books giving information about the various treatments and therapies available to cure or prevent illness in Central Europe at the time. Many of these are still popular today. This sort of book is still to be found on the bookshelves of some of my more elderly acquaintances in Germany. The Unfug contains not only the original thoughts and works of András Petö. There can be up to ten people mentioned on one double page and there are many references to what these people said on various subjects. Surprisingly it has been in only one Internet advert for the book that I have seen this mentioned, even though it is stated quite clearly on the inside of the dust cover. The advert in question said : “Unfug die Krankheiten, Triumph die Seele by Dr. Med. Karl Otto Bärnklau. Examples of papers and documents reworked and edited by Karl Otto Bärnklau." The dust cover of the book explains how Bärnklau had collected information from many difficult- to-access sources and brought them together in this book. It goes on to say that it is not a book to be used for do-it-yourself home-doctoring but as a means of taking a complete new perspective on illness and healing. What did AP actually write? How much of the works are original thought from AP himself, we do not know. Anyone who has read his two books will know how difficult it is to tell where the information that has been collected and reworked finishes and AP's words own begin. He has failed to use quotation marks or any other method of indicating when someone else’s words ends and he himself begins to speak! I have spent many hours over the past few years searching the internet for the many people that AP mentions. I have have had little-to-no success looking for the articles that he has maybe taken words from. I have also looked in antique book shops for books similar to the Unfug, that contain collections of such publications. I have found a few references to some of the same names, including those like Schußler and Kneipp who have provided cures and remedies well known to me as I have used used them myself. I have found only a couple of instances where articles printed on the Internet contain information that is similar to that „quoted“, but not actually quoted, by AP. For example I have found articles written about Moreno and his work in psychodrama and psychotherapy that report on the „Hitler-Psychodrama“ that AP also writes about on page 124 of Unfug. I have a report in German, by Otto Klein written in 1962 after he had visited András Petö and observed his work. I cannot find a single passage in it that corresponds to what isquoted from Klein in Unfug on pages 70-72, although Klein‘s report does contains some of the information that Bärnklau used. 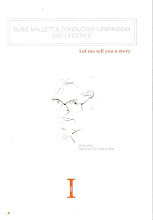 The Unfug chapter that refers to Otto Klein has a completely different style to Otto Klein‘s own writing. Perhaps as the advert that I found for Unfug said it has been „reworked“, it certainly maintains the old-fashioned style of the rest of the book. Perhaps Bärnklau got the information from a completely different article to the one that I have. Who knows? I doubt that we ever will! In these articles, both originally written in German, Bärnklau and Klein wrote about conductive movement-pedagogy. Klein, a bit in the style of Bärnklau, mentioned the names of a few people who, he believed, (or he was told that they had or he has been told have, influenced what he observed in Hungary in the early 1960s. These include: Setschenow, Pavlow, Kretownikow and Pap. Even though I now have a newer copy of the Unfug I will leave it on the shelf at home and continue to keep my old, much-thumbed friend in my bag. What a cornucopia. Congratulations and thanks. Do you really have the date of publication of Unheilbare Krankheiten I was never able track it down, leaving me with the question is this a shortened verson of the Unfug, or is the Unfug and expanded version of Unheilbare Krankheiten? It’s a rum do, that blogger who dive under the duvet as soon as you spotted him. His posting was called Die Lebenskraft-und-Ihre-Beherschung, judging from the URL that you provided, which means in English something like ‘The life force and how to be fluent in it’ (correct me if I am wrong). ‘His blog is called Gralsuche, which means ‘Grailseeker’. I wonder whether he has spotted that two blogs are now after his credentials! The four chaps mentioned by Klein in the early sixties were three Soviets and (presumably) a Hungarian. Klein (and) you used German transliteration. Here are their names in British-English transliteration: Sechenov, Pavlov, Kretovnikov. I have no idea who Pap was and presumably I need say no more here about Pavlov. Sechenov was a major Russian neurobiologist, acknowledged precursor to Pavlov in the study of reflexes, and a (retrospective!) hero of Soviet science. Krestovnikov (note spelling) was a somewhat later Soviet Pavlovian (though not late enough to be a neo-Pavlovian!). What on earth is their reductionist neurobiology doing i the context of the thoughts of András Petö? Just remember the times and the politics. In the USSR and the client satellite stated it was sensible to make frequent tokenistic references to Soviet sources, however irrelevant this might be. Klein was, I believe, an East German. Petö... was being a Hungarian. If I had lived there in those days, I too would have been a stranger to the truth. For whatever reason, Petö’s history is such that my default position is never to believe a word that he said, on anything. The use of the adverb ‘alledgedly’ is an essential tool in your critical kit box every time that you open your Unfug! Your posting above exemplifies this cause for caution. To put it bleakly, how can you believe an admitted liar, about anything. I am willing to suspend disbelief and accept that Petö compiled these two books (documentary proof would still, however, be reassuring). Back in Austria before the War Petö had used some twenty or more pseudonyms to cover the identity of his writings. This was long before he had grounds to fear the Hungarian night-time knock on the door So why did he do it? And yes, on whose authority do we have it that the writings referred to under other names were indeed written by himself, pseudonymously? Petö’s presumably. You are trying to track down a host of authorities referred to in the Unfug. Who says that they all even ixisted? Petö. The logical problem is that, once somebody declares himself a pseudonomist, then you can never believe anything that he says about sources and authorship. Yes indeed, you do seen to have taken on a quest for life! Such a shame that more people have not been interested. Keep up the good work! PS I believe that you have mentioned having a run of old issues of The Conductor. Dig back and you will see some extracts, translated, into English, of a bizarre and massive smokescreen that he erected in the Rakosi years, a long and detailed published article on the wonders of Soviet neuroscience. Lots more wholly irrelevant chaps mentioned there! And for me, the tantalising question is how on Earth he ever knew such things! Thank you Andrew for all this extra information. No, I do not have the date of publicaton for the Unheilbare Krankheiten, I have always asked the same question as you do: "which egg or which chicken came first?". I think I confused you by calling it the first book, I meant to write the first of the books that I acquired. This book was always the easier to track down of the two and was the first one that I read. Yes, I do have a selection of old copies of The Conductor, but not the complete set. I hope those I do have include the one with this article, but I suspect not as I have only recently re-read them and I do not recall a long and detailed article on the wonders of Soviet neuroscience. Thank you for the tip, I will try to dig it up from somewhere. Do you know any of the other twenty or more pseudonyms that AP used? Anymore comments and information on this subject will be very gratefully received. Especially if anyone comes up with an answer to your very last question. How did he know? I can tell you that in the National Library of Conductive Education there is a collection of short and long pieces allegedly written by Peto under a variety of psuedonyms - up to 18 were used, I think. Some items were about TB and some not clear at all to me as they are written in German. These were published in journals that Peto allegedly had a hand in editing - if I remember correctly! Gill,you are being in danger of being over-generous here. Yes, these are indeed 'articles' but they are short newspaper articles/reports rather than journals in the contemporary academic sense.